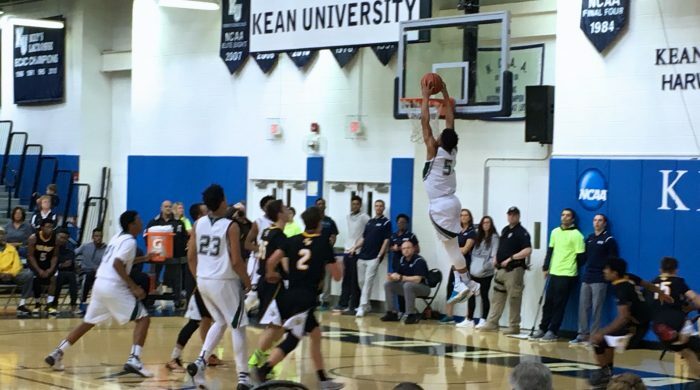 St. Joseph's standout and Syracuse commit, Tyus Battle throws down a dunk in the first period against Notre Dame in the Non-Public A South Semifinals in Metuchen on March 8th. 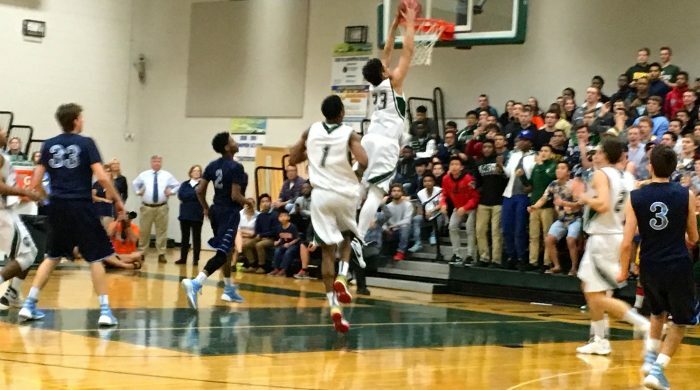 Battle was selected as the 2016 GMC Hoops Player of the Year. St. Joseph's standout and Mississippi commit skies for a two handed jam in the first half against South Brunswick in the GMCT Championship. 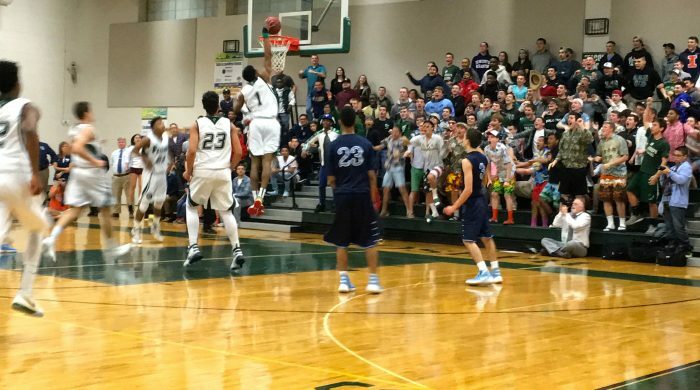 Tyree has been recognized by GMC Hoops as the 2016 Dunker of the Year. Eric Savage embraces South Brunswick head coach, Joe Hoehman towards the end of the CJ Group Semifinal game against Colts Neck. GMC Hoops recognized Hoehman as the 2016 Coach of the Year. 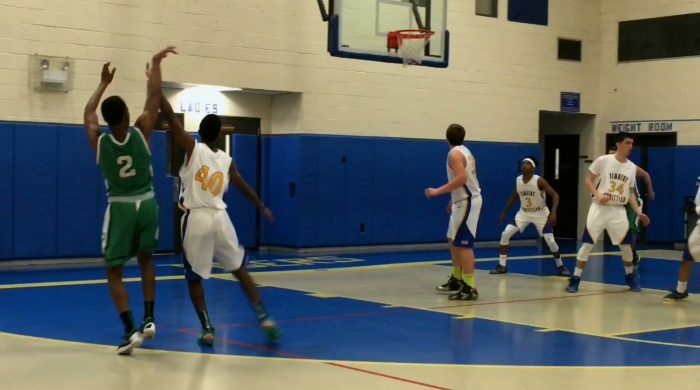 South River's Derrick Whitaker releases a baseline jumper against Wardlaw on January 7th. 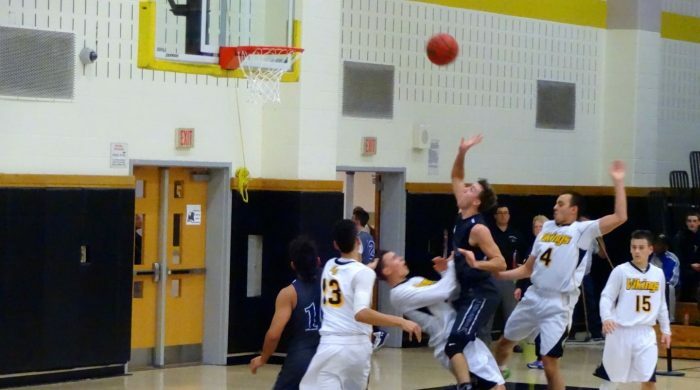 Whitaker was one of the leading scorers in the Greater Middlesex Conference this season as a freshman. GMC Hoops recognizes Whitaker as the 2016 Freshman of the Year. 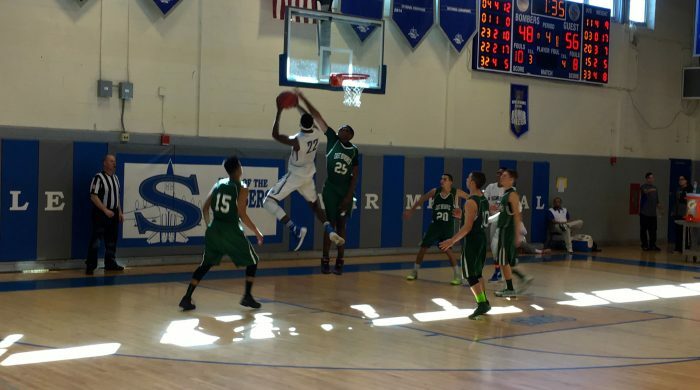 St. Joseph's Alanzo Frink skies for a score against Notre Dame in the 2016 Non-Public A South Semifinals on March 8th. Frink was recognized by GMC Hoops as the Sophomore of the Year. 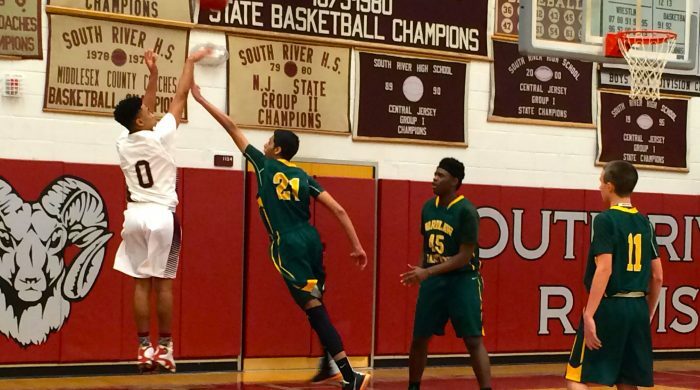 Timothy Christian sophomore, Pierce Kokosinski goes up for a shot against Piscataway Tech on February 8th. GMC Hoops recently recognized Kokosinski as the 2016 Most Improved Player of the Year. 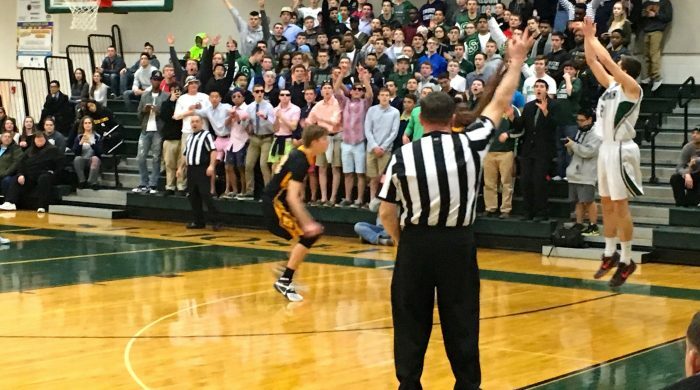 St. Joseph's senior, Branislav Vujadinovic fires up a three against St. John Vianney in the 2016 Non-Public A South Quarterfinals on March 4th. Vujadinovic demonstrated that he could do more than shoot this past season as he was recognized as the 2016 GMC Hoops Defensive Player of the Year. 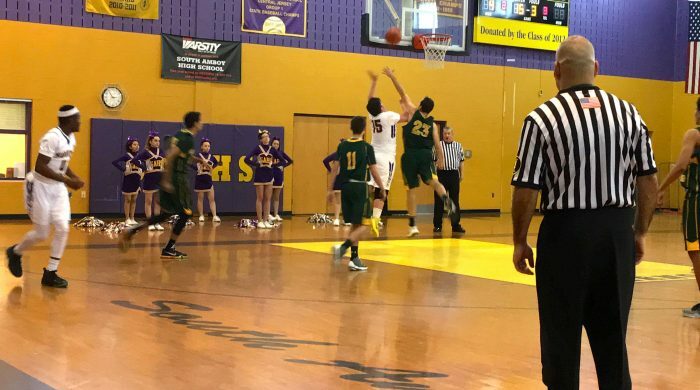 South Amboy's Nick Reagan goes up for a layup against Wardlaw in the 2016 GMCT Play-In Round on February 13th. Reagan overcame knee injuries in each of the last two years to get back on the court and earn the GMC Hoops Comeback Player of the Year. 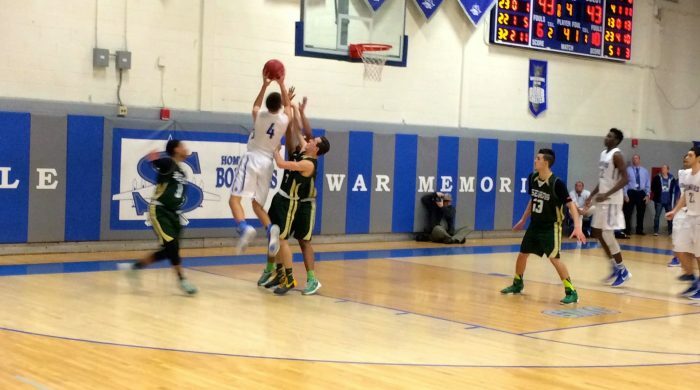 Sayreville's Ryan O'Leary goes up for a shot against J.P. Stevens in the fourth quarter at the Bomb Shelter on February 2nd. O'Leary, who transferred in from South Amboy, was a huge addition to the Bombers to earn the 2016 GMC Hoops Impact Player of the Year. 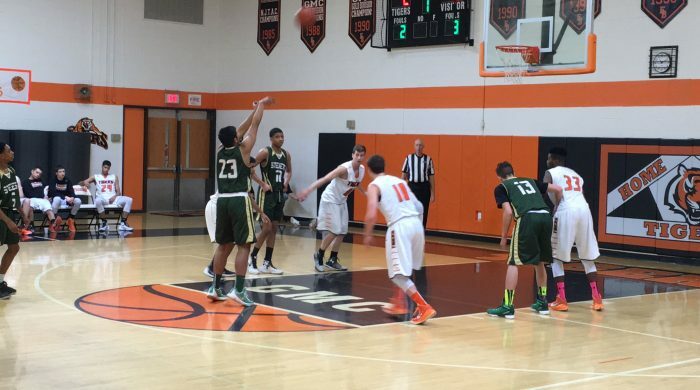 J.P. Stevens junior, Rishav Ghosh, releases a free throw in a state tourney tune-up game against East Brunswick Tech on February 27th. Ghosh averaged 6.2 ppg and 4.9 rpg off the bench for the Hawks to earn the 2016 GMC Hoops Sixth Man of the Year. 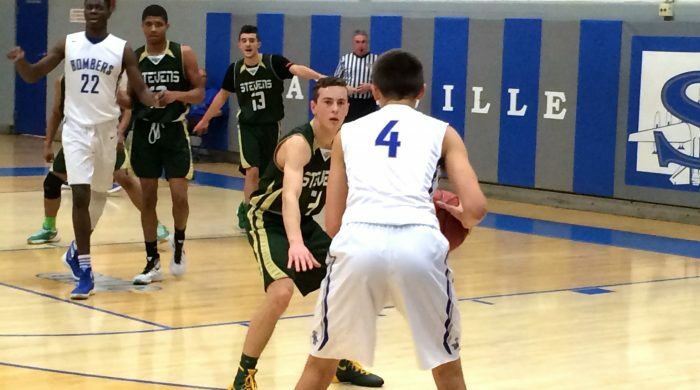 J.P. Stevens senior guard, Alex Corrigan, defends against Sayreville's Ryan O'Leary in a GMC White clash on February 2nd. Corrigan and his Hawks limited opponents to just over 40 ppg to earn the 2016 GMC Hoops Defensive Team of the Year. 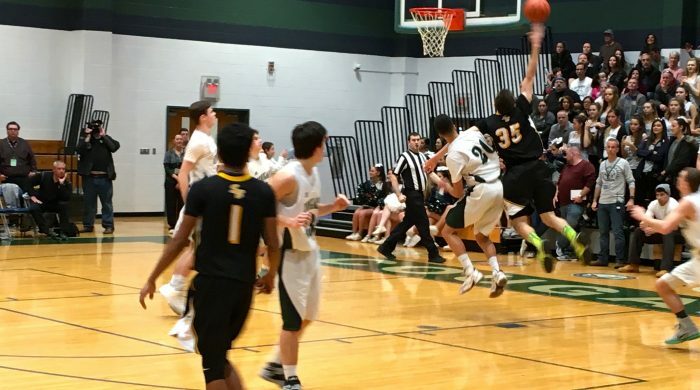 Led by Eric Savage, seen putting up a shot in the fourth quarter against Colts Neck in the 2016 CJ Group 4 Semifinals on March 5th, the South Brunswick Vikings improved by six games over last season to earn the GMC Hoops Most Improved Team of the Year honors. St. Joseph's senior Tyus Battle elevates for a three pointer in the first half against Notre Dame in the 2016 Non-Public A South Semifinals on March 10th. Battle along with Bree Tyree led the way for the Falcons, which reclaimed the GMCT Championship to earn the GMC Hoops Team of the Year honors. 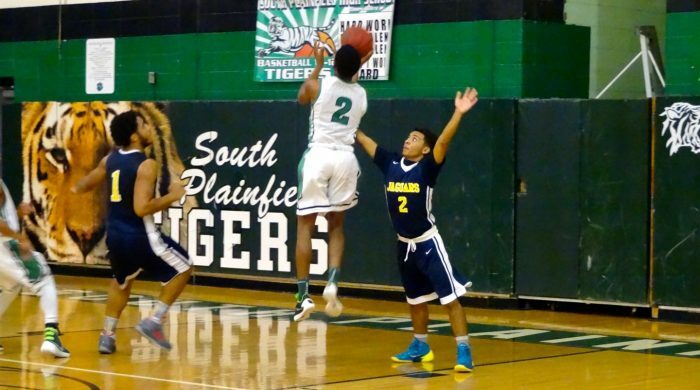 South Plainfield's Lamont Williams follows through on a three pointer in the second period against Timothy Christian in the 2016 GMCT Play-In Round on February 13th. Williams led the conference with 76 three pointers, and earned the GMC Hoops Sharpshooter of the Year Award. Old Bridge's Connor Romano lets go of a floater in the first half against South Brunswick on December 22, 2015. Romano found his way to the line a lot this season, and made the most of it with a conference leading 146 made free throws to earn the 2016 GMC Hoops Hoopshooter of the Year. 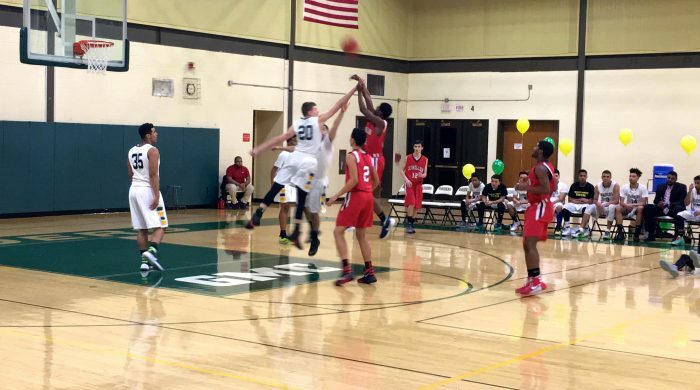 South Plainfield's Lamont Williams goes in for a layup over an Academy of Urban Leadership defender in the opening round of the 2015 Anthony J. Cotoia Holiday Tourney. Williams led the GMC in scoring with a 23.2 ppg average to earn the GMC Hoops Top Scorer of the Year award. Dunellen's Tyquan Fowler gets a foul line jumper off over a Piscataway Tech defender in a GMC Gold Clash on February 10th. Fowler ranked 10th in the GMC in scoring with a 17.3 ppg average to earn the 2016 GMC Hoops Best Kept Secret Award. The Sayreville Bombers, shown here huddling up before a 2016 contest against East Brunswick at the Bomb Shelter, is one of 12 teams competing at the Kean Spring League. The Sayreville Bombers are playing in the 2016 Kean Spring League. 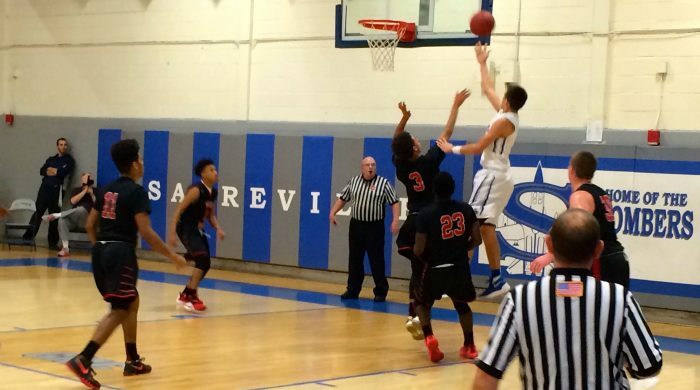 To see big man and the Bombers in action, check out Sayreville's schedule for this spring. Despite the efforts of junior Ryan O'Leary, seen here against Woodbridge during the regular season, the Sayreville Bombers fell to Verona at the 2016 Kean Spring League on Wednesday night. 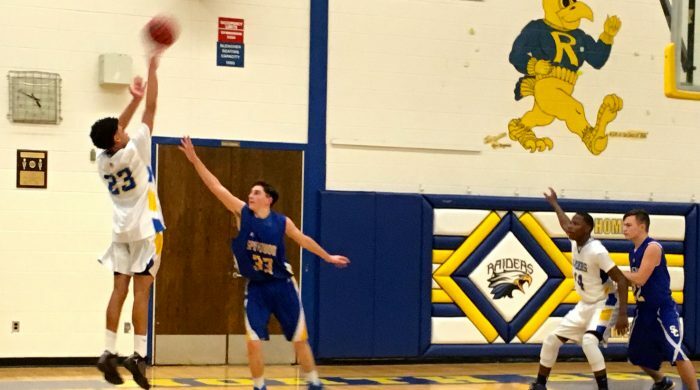 North Brunswick sophomore, Jordan Salisbury releases a three point shot over Spotswood’s Justin Dekovics in the 2016 East Brunswick/GMC JV Tourney Round of 16 on February 16th at NBTHS. Salisbury, who averaged 12.3 ppg in four JV games covered by the site, was selected by GMC Hoops as the 2016 JV Player of the Year. 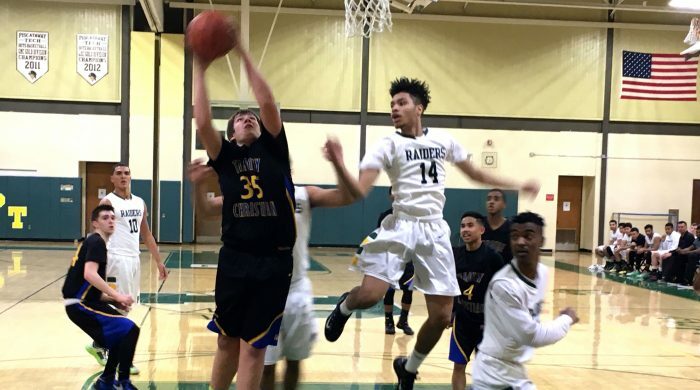 On Friday night, the 2017 Greater Middlesex Conference Tournament reaches its climax with both the Girls and Boys Championships and 6:00 and 8:00 PM. GMC Hoops will be covering both games starting at 6:00 PM with the Girls final between 3rd seeded South Brunswick and top seeded Sayreville followed by the Boys Final between 3rd seeded Sayreville and top seeded St. Joseph’s. 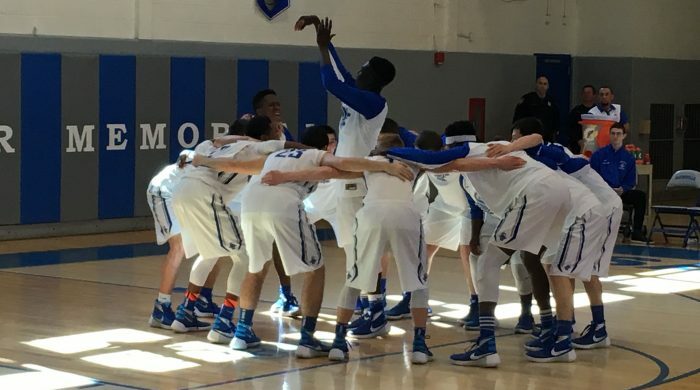 The Bombers are playing in the MCT/GMCT Championship for the fourth time ever, and are looking to win their first title since defeating Carteret in the 2000 GMCT Final. 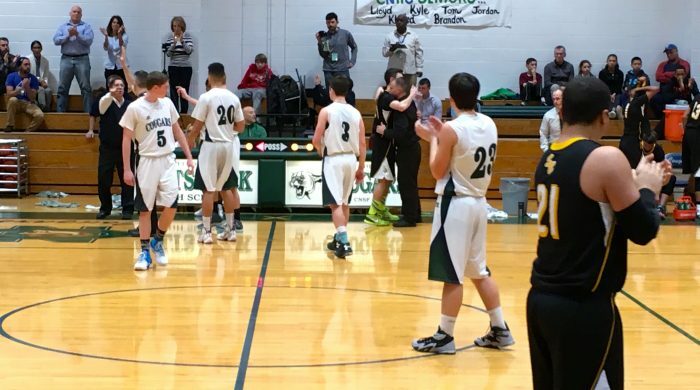 St. Joseph’s is playing in its 10th straight GMCT Championship, and looking to win its 6th in the past 7 years. The Falcons are also looking to win their 10th all time in 23 finals appearances. Read the GMC Hoops 2017 GMCT Championship Preview. 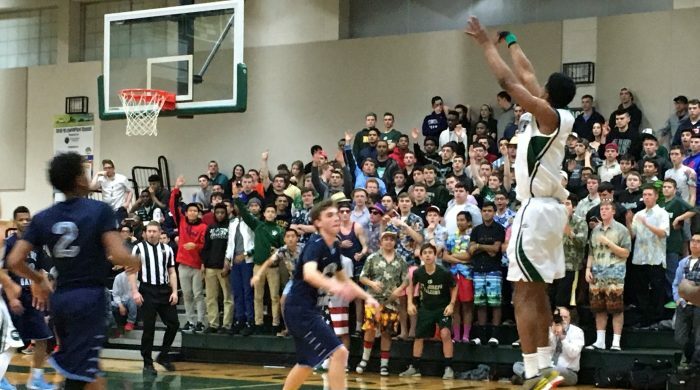 Also read Greg Machos’ latest Taking It to the Rack Column on St. Joseph’s remarkable season as well as James Corrigan’s recap of the regular season in the blog. Reminder: GMC Hoops Radio will be broadcasting both Greater Middlesex Conference Tournament Semifinal games. If you are not able to attend the games, you can follow along by listening to the broadcast at http://www.spreaker.com/user/8650509. You can follow the coverage of Greater Middlesex Conference boys basketball on Twitter @gmchoops and Facebook at http://www.facebook.com/GMCHoops.